Once you've painstakingly tried to pronounce and understand the French title, you'll find the latest attraction to bless Disneyland Paris is in fact one of their most innovative yet. 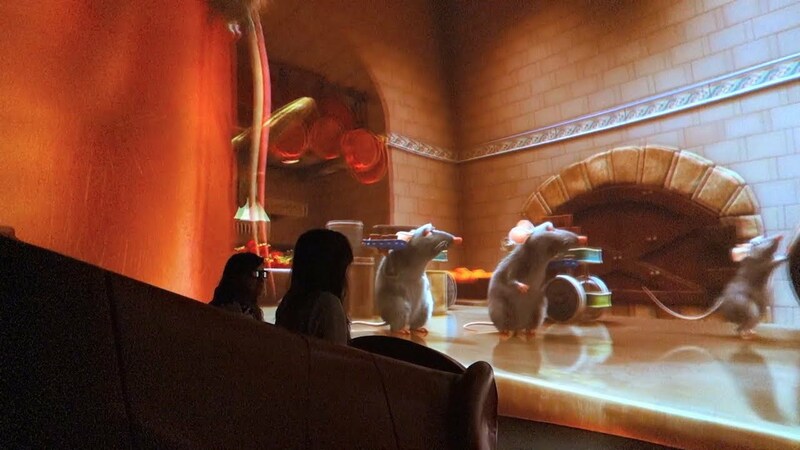 Combining trackless car technology with 3D visuals, Ratatouille simulates a chase through Gusteau's restaurant, shrinking you to the size of a rat as you flee desperately from the disgusted chefs and diners. We had the worst luck in the queue as the ride broke down for a good 20 minutes soon before we were due to get on, but once we finally did, it definitely proved itself to be a fantastic addition to the theme park. Disneyland Paris is the only Disney resort to house the original Star Tours experience, which first debuted at the original Disneyland in 1987. This motion simulator takes guests on a voyage to the moon of Endor on the StarSpeeder 3000 - however, thanks to an incompetent robotic pilot, the trip takes a turn for the worst and leads the ship into a battle against an Imperial Star Destroyer. While it's the same experience each time, the ride has plenty of charm - notably with a pleasant aiport-esque atmosphere in the queue and boarding area, and the immersive technology which flawlessly pulls you into the experience. The 3D sequel Star Tours: The Adventures Continue has replaced Star Tours at every other Disney resort, and Paris will receive it in 2017 - marking this original rides final closure. It will be missed. Despite opening in 2007, Crush's Coaster remains one of the most highly populated attractions in Disneyland Paris, with horribly long queues even during quiet days. The popularity even made a FastPass system impossible, as so many people utilised it that the entire point of jumping a long queue was instantly defeated. So, is this ride worth such a tedious wait? It definitely is for newcomers. Once you finally board the spinning shell car and traverse round the track, you're treated to some superb scenery and animation featuring the Finding Nemo characters; and then the calmness all changes once you climb a huge lift hill and spiral around a fast paced course in complete darkness. There are no inversions, but that doesn't detract from the thrills - thanks to the sharp turns and immense sense of speed. The queue is unbearable, but you'll be dying to go again when the ride is over. Disney originally intended their Parisian Indiana Jones attraction to be a huge experience, with numerous attractions in a large themed land. But when budget cuts forced the financially unstable resort to rethink it's larger ambitions, the plan was simplified to an outdoor roller based on an escape from a cursed temple. A good ride for the slightly older crowd, Indiana Jones takes elements from wild mouse coasters but adds it's own intense thrills, with stomach dropping inclines, a 360 degree inversion, and extremely bumpy sharp turns around the temple like structure, which the train speeds through at nearly 40 miles per hour. It's short and simple, but still a fast paced and memorable experience. 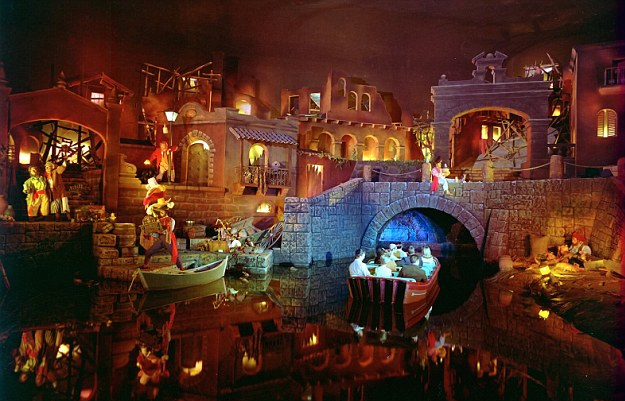 A classic attraction at every Disney resort, Pirates of the Caribbean is not only an engrossing water ride, but also an iconic one - giving birth to the classic Pirates Life for Me folksong and being the inspiration for Disney's mammoth film franchise of the same name. The ride takes you on a journey through a pirate riddled landscape, through the expansive seas, humble towns, and dark grottos. On your journey, you encounter intense battles, drunk hooligans, and caves littered with glorious treasure, crafted through beautiful scenic design and lifelike animatronics. Thankfully you don't get too wet, which would be horrific in the cold French weather, and so it's definitely one of Disney's best rides for all kinds of age groups.